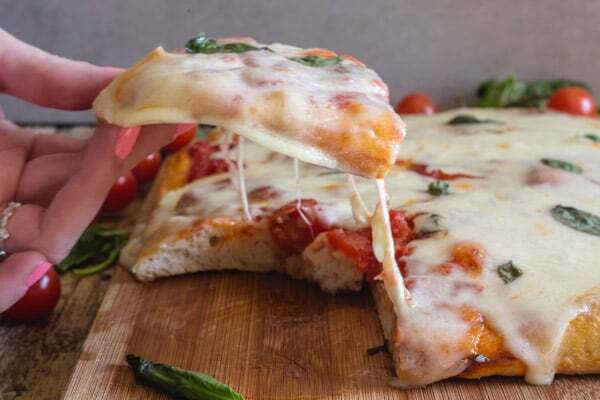 No Knead Pizza Dough, make it thick crust or thin! No over 12 hour rising time, ready in two hours. 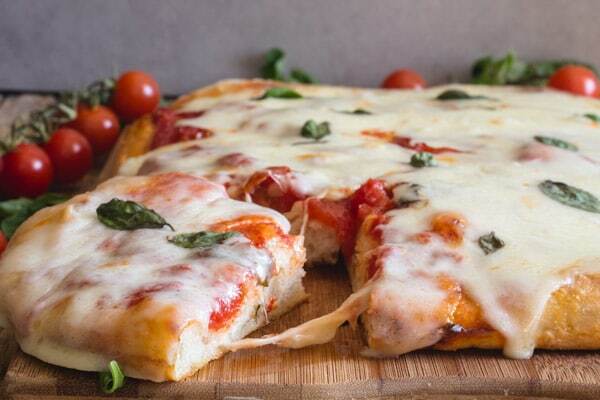 Pizza Margherita never tasted so good! This is the perfect Weekend Pizza Dough, fast and easy. Make it your own way or even one of our favourites, Pizza Bianca or a Sauteed Mushroom and Pancetta Pizza. I don’t know if you have a pizza night in your house, but in our house it’s usually Friday night. But as far as me and my kids are concerned it could probably be every night. If there is one thing I have learned from being in Italy you can make Pizza any way you want! Between pizza and pasta I never imagined all the different types there are. I learned the perfect snack for a growing kid is pizza, the perfect appetizer is a slice of Pizza Bianca sliced in the middle (like a sandwich) add a few slices of Mortadella or Prosciutto and there you have Italian Party food. I know it’s easy to find a good already made Pizza Dough now, from the grocery store, the bakery or even your favourite pizzeria. But you have to admit Homemade is better! After making the perfect No Knead Bread, I thought why not a good no Knead Pizza Dough? I also have a a really good Pizza Dough made the old fashioned way! Yes a little kneading is required. But so good. This No Knead Pizza Dough is fast and easy and ready to go in 2 hours. I made one Margherita Pizza with a thick crust, but if you prefer a thin crust then you could get two pizzas with the dough. 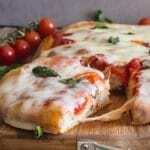 What are the ingredients for Pizza Margherita Sauce? 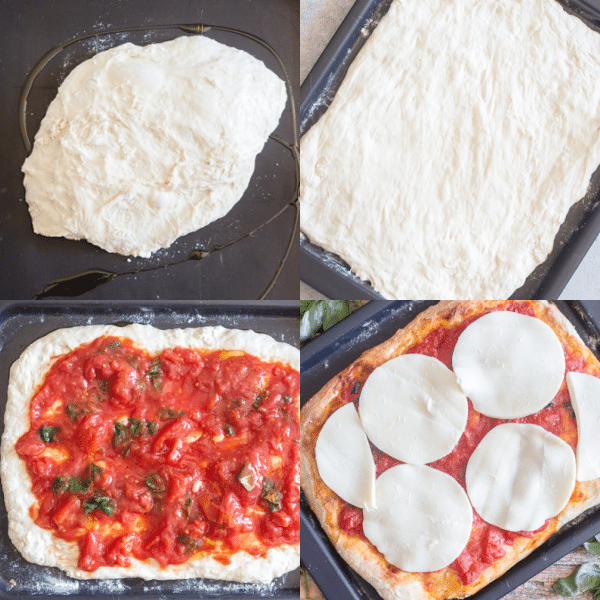 There are only 4 ingredients in Pizza Margherita Sauce, a can of Pelati (peeled) Roma or San Marzano Tomatoes, be sure to get the ones with no extra ingredients. Just the tomatoes, Plain and simple. Fresh Basil (a must), olive oil and a little salt. No need to cook just mix it all together. When was Pizza Margherita Invented? 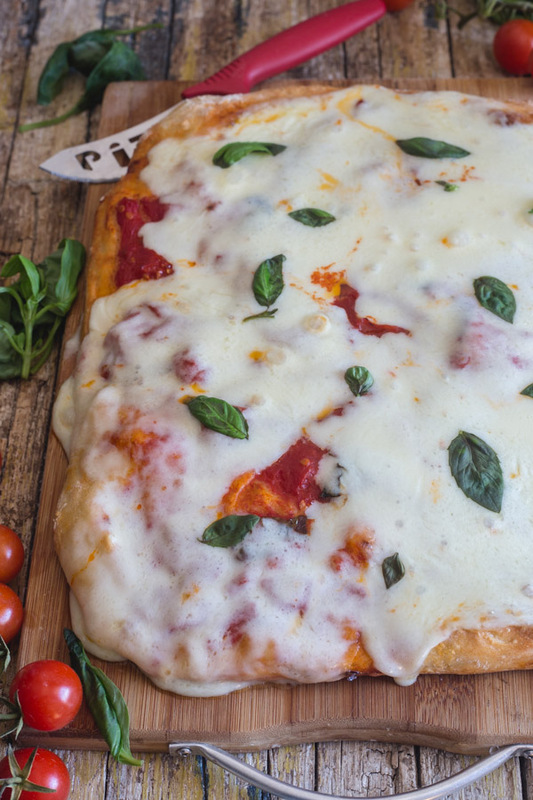 The Pizza Margherita was first made in June of 1889 in Naples, to honour the Queen of Italy, Margherita of Savoia. Raffaele Esposito the chef, prepared the “Pizza Margherita”, topped with tomatoes, mozzarella and fresh basil, these were the colours that represented the Italian Flag. What Cheese to put on Pizza? 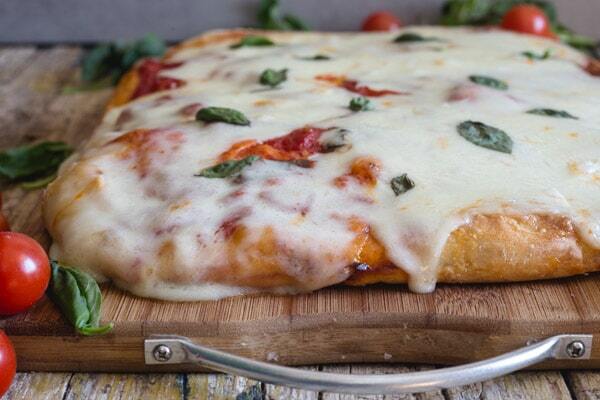 To make the best baked Pizza I always use a firm mozzarella rather than fresh. I find fresh mozzarella has too much liquid and can make your dough soggy. Although if you prefer fresh then just place the cheese in a sieve over a bowl and leave it in the fridge over night to remove a lot of that extra moisture. Then just cut or slice it before topping your pizza. 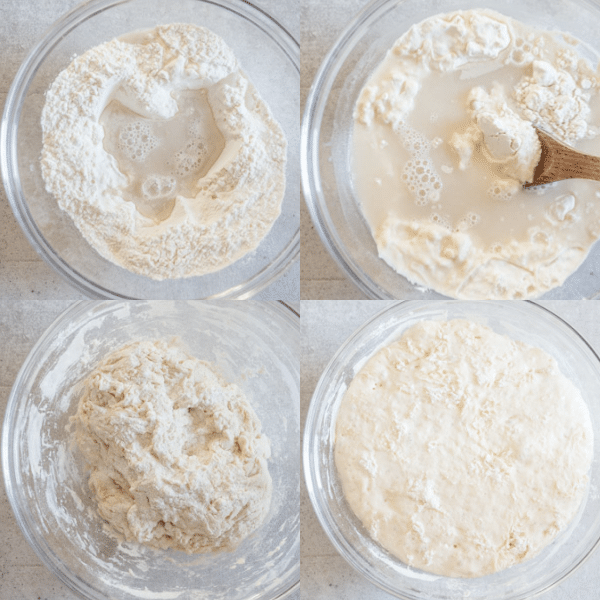 So if Pizza night for you is Friday or Saturday, or maybe you have a whatever day, then I hope you give the No Knead Pizza Dough a try and let me know what you think! Buon Appetito. **sliced mozzarella or shredded, as much or as little as you want. In a small bowl add 1/4 cup lukewarm water and sugar stir to combine, then sprinkle the yeast on top. Let sit 5 minutes then stir to combine. In a large bowl add the flour and make a well in the middle, add the yeast mixture and remaining water, start to mix then add the salt and combine well. Cover the bowl and place in a warm draft free place for 2 hours. Place the risen dough on a lightly oiled (olive oil) cookie sheet (or two if you prefer thin crust pizza), let rest 20 minutes. While the pizza is resting make the sauce, in a medium bowl add the tomatoes and sauce from the can (roughly chop), add the salt, olive oil and fresh chopped basil. Combine well. Pre-heat oven to 425F (220C). Spread the rested dough on the pan (or pans) and top with the tomato sauce, drizzle with a tablespoon of olive oil. Bake for 10-15 minutes or until crust is done, remove and top with the mozzarella cheese, bake again for approximately 2 -3 minutes or until cheese has melted. Slice and serve. Enjoy! Thank you for all your wonderful recipes! Can this dough be made a day before and put in the fridge uncooked? Hi FM thanks so much, glad you like the recipes. Yes it can be kept in the fridge. Let me know how you like it. Made the refrigerated dough the next day and it was fantastic. My boys have asked me to make this again! Thanks again. Hi FM, thanks so much, so glad you all enjoyed it. Have a great weekend. Hi Roland, thanks so much, I hope you enjoy it. Let me know. Hi Rosemary, Can you substitute whole wheat flour for all purpose? Hi Patricia if you substitute whole wheat apparently you need to add extra water, so add 1 1/2 tablespoons extra of water. Let me know how it goes. Hi Rosemary. I made this yesterday for my grandchildren. I used a 9 in square pan which gave me a perfect thick crust pizza. It’s definitely a keeper since both kids (and nana) loved it. Going to double the recipe next time and use a 9 x 13 pan. Thank you. Hi Ann, thanks so much, so glad you and your grandchildren enjoyed it. Have a great weekend. This recipe for pizza dough sounds nice and easy. No waiting around half the day for my dough to rise. Plus it looks soooo tasty! I’m into some quick and easy meals and pizza is a nice start. I will be trying your recipe this weekend. Hi Dalila thanks, and yes it is really easy and tastes good too. I hope you enjoy it, let me know. I love your site and your recipes. I’m in love with Italian food and I’m glad I now have an Italian in MY kitchen: Thanks for all your hard work. I may be blind but I can’t seem to see the amount of yeast in this recipe. Could you please help me out. Hi Marina thanks so much, so glad you found me too, and yup I forgot it, but it’s added now, 1 teaspoon of active dry yeast. Have a great weekend. How much yeast? I didn’t see the quantity in the recipe. Hi Kimberlee, thanks for that, 1 teaspoon and I looked at it 10 times before I posted it. Have a great weekend.